DETROIT – NHL commissioner Gary Bettman continues to insist that the league is not exploring the relocation of the Phoenix Coyotes and there are multiple parties that could buy the team. In fact, he said Sunday that action is hotter than ever before. “There seems to be more interest at this particular point in time than we’ve seen throughout the process,” Bettman said Sunday. Of course, this is the same commissioner who scorned speculation that the Atlanta Thrashers would relocate – right up until the Thrashers moved to Winnipeg and became the Jets. Of course, this is the same NHL that has owned the Coyotes, covered their losses and failed to sell them for years. And of course, just because the action is hotter than before doesn’t mean it will be hot enough for a deal. But give Bettman a few things: As a lawyer, he is precise with his language. He is difficult to pin down, and he is persistent. “We’re not planning on moving Phoenix as we stand here today,” Bettman said. Bettman said that means keeping the Coyotes in Glendale, Ariz.
Has Bettman been following the NBA’s board of governors and the decision whether to move the Sacramento Kings to Seattle? “Just from afar,” Bettman said. Would that affect Phoenix, because an NBA and NHL team could play in a new Seattle area? 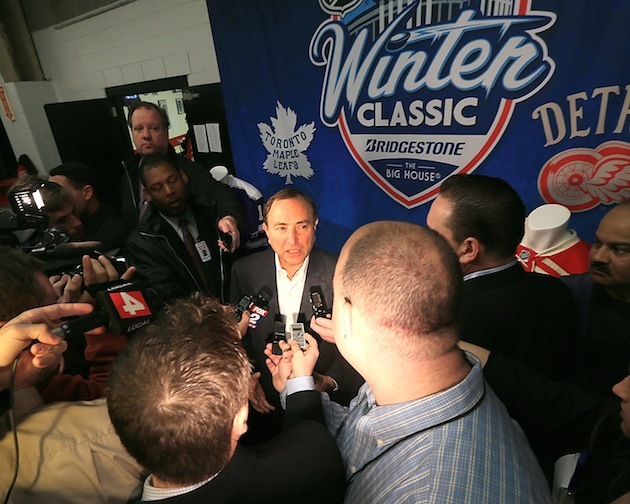 Asked about Seattle as a potential NHL market in general, Bettman spoke highly. There was a pause and awkward silence after that. Bettman seemed to realize how that might come across, not only because of the Coyotes, but because of a new realignment of the league that seems destined for 32 teams. “But that doesn’t mean that anybody should take from that comment that we’re necessarily focused on Seattle or we’re planning on expanding there,” Bettman added quickly. “You asked the question about Seattle. I wouldn’t have raised it. But it’s obviously an interesting market.